Swipe right to see entire table *Print postage using your existing laser or inkjet printer. 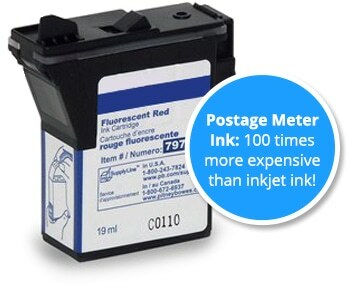 Postage meter ink-up to 100 times more expensive than inkjet printer ink! That’s up to $0.10 per print! Stamps.com uses the standard ink used in your desktop printer and ends up costing about $0.001 per print. Postage meter ink is about 100 times more expensive than even the most expensive inkjet printer ink or laser printer toner! These additional fees may be added to your monthly bill and can add significantly to the total cost. Some are one-time fees, like the $25 to ship your postage meter to you or to replace it if something goes wrong (yes, you pay for replacement shipping, not them). Other charges are incurred every month, such as equipment insurance (up to $12 per month). Reset fees are “processing” or other charges added to the amount of postage you buy. For example, if you load $200 into your postage meter, there is often a $5-10 fee that is charged on top of the postage. Many current sales reps will tell you that they no longer charge reset fees, but most existing meter contracts still have them. As you know, postage rates usually increase every January and May. With postage meters, this simple 30-second software upgrade may cost you hundreds of dollars. What choice do you have? None. Most meters won’t even function without the upgrade. It’s just another way the postage meters can get more money out of you. At Stamps.com, you’ll never be charged a fee. Postage rates are automatically changed for you. You’ve got to be kidding. Property tax is an added fee you must pay each year based on the percentage of the value of the equipment. A return-to-inventory fee is a charge you may see even after your lease obligations have been met. That’s right, meter companies actually charge you to return their equipment. Many postage meter companies will raise your rates every year depending on how much postage you used in the prior year. Here’s the theory: the more that you are actually using your postage meter, the more you probably need it for your business. They can raise the price every year and you probably won’t cancel because you need it. They’ve got you right where they want you. If you want to print a logo or other message next to your postage, meter companies will charge you up to $95 per image! Actually, the cost to them is minimal and it uses a lot more of their expensive inks, so they win both ways. With a Stamps.com solution, images and logos are free - add as many different looks to your mail as you want! Postage meters need phone lines in order to add postage to the the account. Since most companies don’t want to tie up their phone lines, they are forced to purchase an extra phone line. That’s a lot of money every month. With Stamps.com all you need is your existing internet connection to add money to your postage account. Stuck in a meter lease? We can still save you money. Simply shut off your meter and start using Stamps.com instead. The postage meter fees and charges alone (on top of your monthly lease fees) add up to much more than the cost of Stamps.com service, so you’ll save money just by turning off your meter and avoiding all the extra postage meter expenses.